Ten-man Leicester rallied against the odds as the champions overcame Jamie Vardy's contentious 28th-minute dismissal and a two-goal deficit to draw 2-2 at Stoke. Referee Craig Pawson, who only booked Manchester United's Marcos Rojo for a two-footed lunge on Wilfried Zaha on Wednesday, sent off Vardy when he dived in on Mame Diouf but appeared to return to the ground by the time the tackle was made. 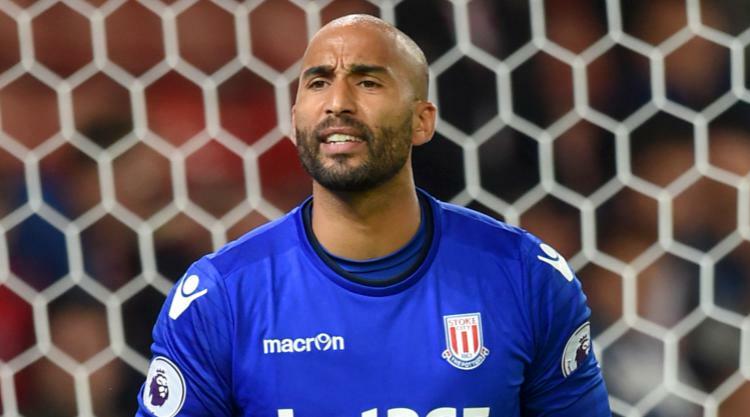 Pawson then gave Stoke a penalty that Bojan Krkic converted for handball against Danny Simpson and booked five Foxes players from the 38th minute until half-time, when the Potters were 2-0 ahead thanks to Joe Allen. However, Claudio Ranieri's side dug deep and goals from Leonardo Ulloa and Daniel Amartey saw them claim just their second point on their travels in the most unlikely of scenarios. With Pawson's first-half performance prompting such frustration in the Foxes' ranks, the typically placid Ranieri had to be dragged away from the referee by Kasper Schmeichel at the interval, yet when the full-time whistle went, the Italian was back fist pumping in front of the travelling support. Prior to Vardy's dismissal, an entertaining, open game had been staged, with the returning Schmeichel saving brilliantly with his foot from Jonathan Walters' six-yard effort and Stoke keeper Lee Grant making three stops at the other end. With Andy King's crucial block also preventing Bojan from opening the scoring, it looked like the first goal would prove pivotal. As it was, it was Vardy's 28th-minute red card that set the tone. The England striker was chasing back to make a tackle alongside Glen Johnson and, with the full-back leaning into him, Vardy left the ground to lunge into a challenge on Diouf, though he had returned to the turf by the time he slid in. Referee Pawson, who had been criticised for his decision only to book Rojo on Wednesday, immediately showed a red card. The visitors felt hard done by and their frustration only grew when Pawson awarded a penalty as Bojan's cross struck Simpson's arm, which was in an unnatural position bent above his head. The protests fell on deaf ears as Bojan, who missed the last penalty he took here against Bournemouth, stepped up and sent Schmeichel the wrong way. Having fallen behind, the visitors then completely unravelled, with Simpson's caution in that incident the first of five in quick succession. King was cautioned for a rash challenge, Islam Slimani and Christian Fuchs were both booked for dissent and Marc Albrighton's name was taken for a foul on Glen Johnson on the edge of the box. From that free-kick, Johnson went short to Giannelli Imbula, whose shot hit the post and came back off Schmeichel's back, with Allen all alone to finish into the unguarded net to make it 2-0 before the break. Such was Leicester's anger at Pawson's performance, the normally mild-mannered Ranieri had to be dragged away from the official by Schmeichel and he was still venting his fury near the tunnel, where the visiting support also ranted in the referee's direction. Any chance of Pawson not taking centre stage upon the resumption was dashed as he delayed his return to the pitch and then booked Huth within three second-half minutes, ensuring the German, Fuchs and Vardy will all be suspended on Boxing Day against Everton. However, with everything seeming to go against them, Leicester fought back and reduced the deficit 16 minutes from time through substitute Ulloa, whose header from Demarai Gray's cross went over the line before Ryan Shawcross could hook clear. And with the hosts unable to quell the Leicester spirit, Amartey headed in an equaliser from Fuchs' cross in the 88th minute in a resolute performance befitting of the current champions.